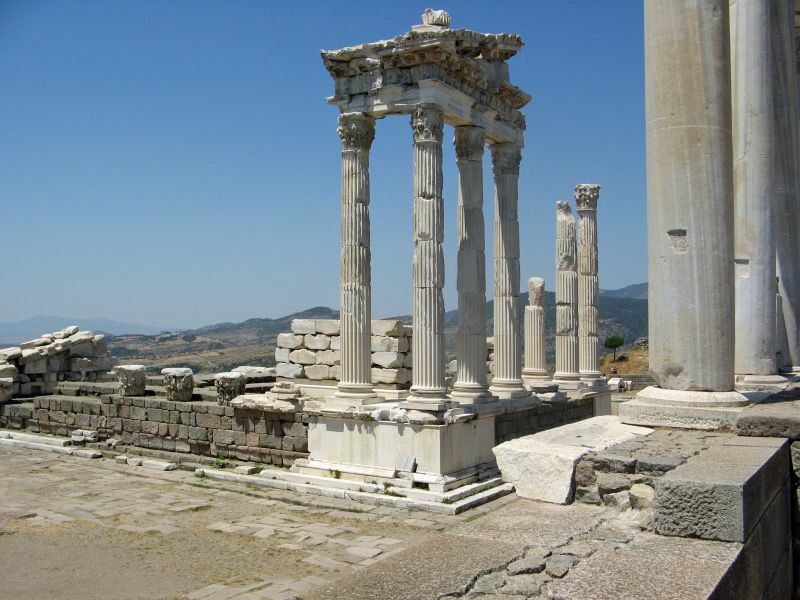 Some ancient authors regarded it as a colony of the Arcadians, but the various origin stories all belong to legend. 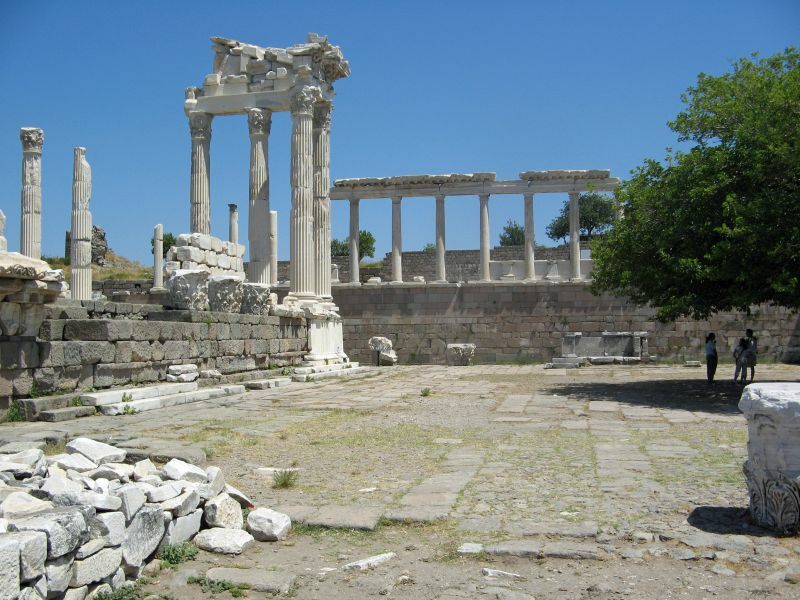 The Greek historians reconstructed a complete history for it due to confusion with the distant Teuthrania.It became the capital of the Kingdom of Pergamon during the Hellenistic period, under the Attalid dynasty, 281–133 BC. 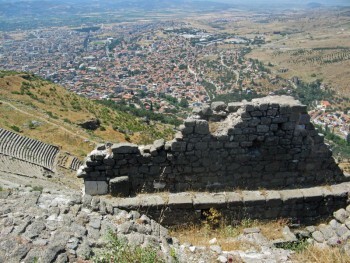 Pergamon is cited in the Book of Revelation as one of the seven churches of Asia. 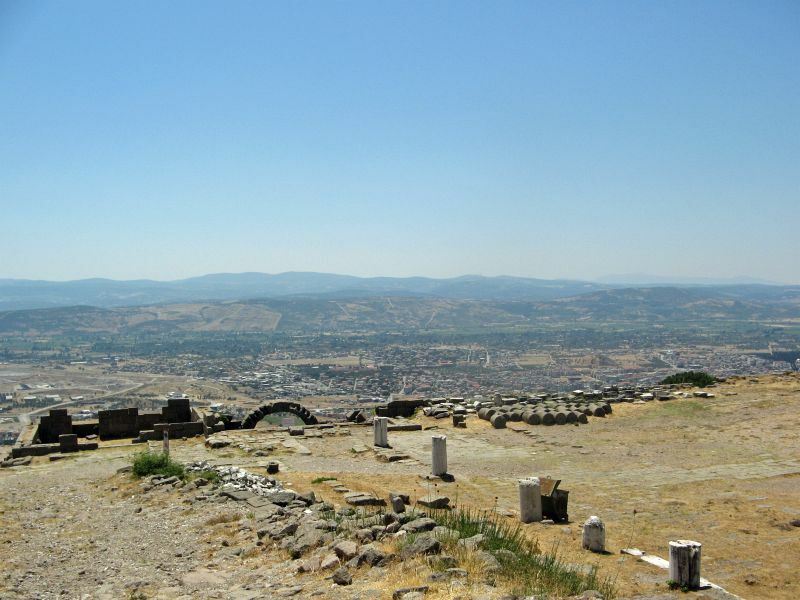 Xenophon provides the earliest surviving documentary mention of Pergamon. 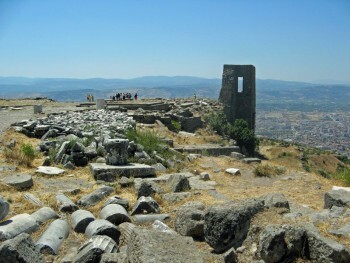 Captured by Xenophon in 399 BC and immediately recaptured by the Persians, it was severely punished in 362 BC after a revolt. 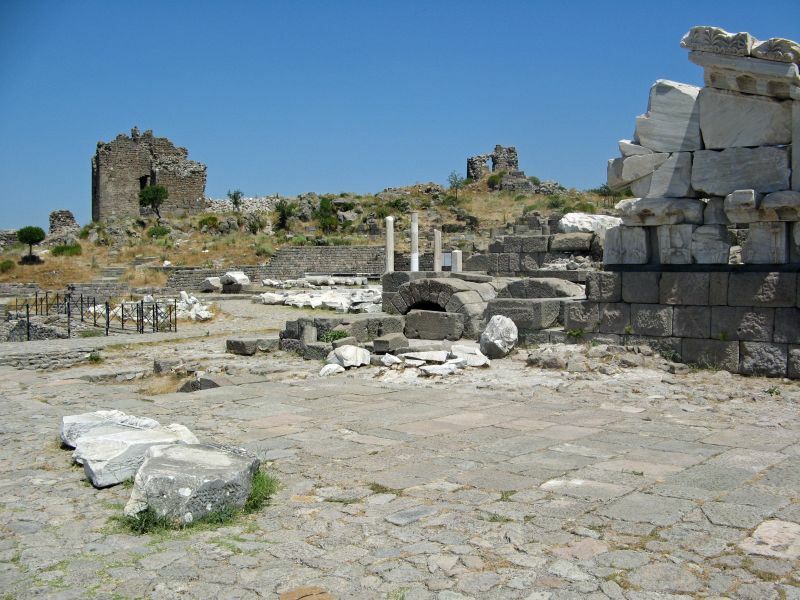 It did not become important until Lysimachus, King of Thrace, took possession, 301 BC, but soon after his lieutenant Philetaerus enlarged the town, the Kingdom of Thrace collapsed and it became the capital of the new kingdom of Pergamon which Philetaerus founded in 281 BC, beginning the Attalid dynasty. 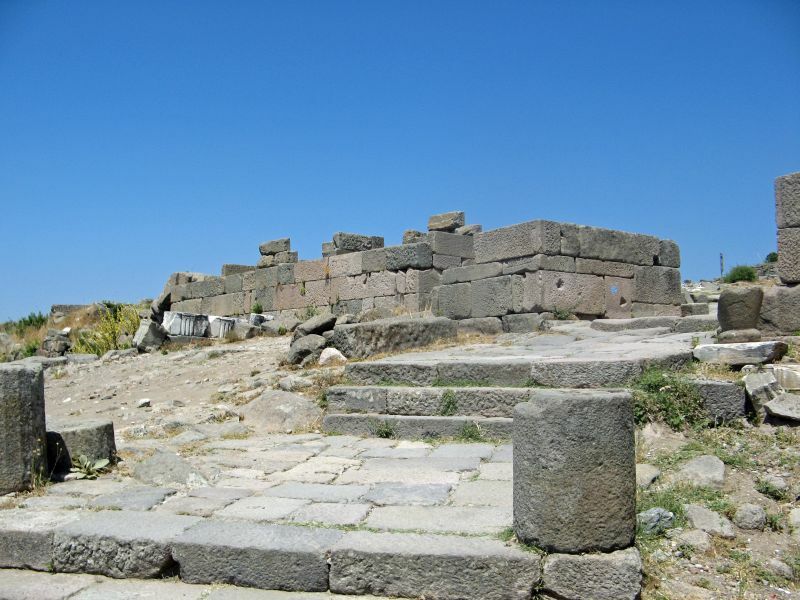 In 261 BC he bequeathed his possessions to his nephew Eumenes I (263–241 BC), who increased them greatly, leaving as heir his cousin Attalus I (241–197 BC). The Kingdom of Pergamon, shown at its greatest extent in 188 BC. 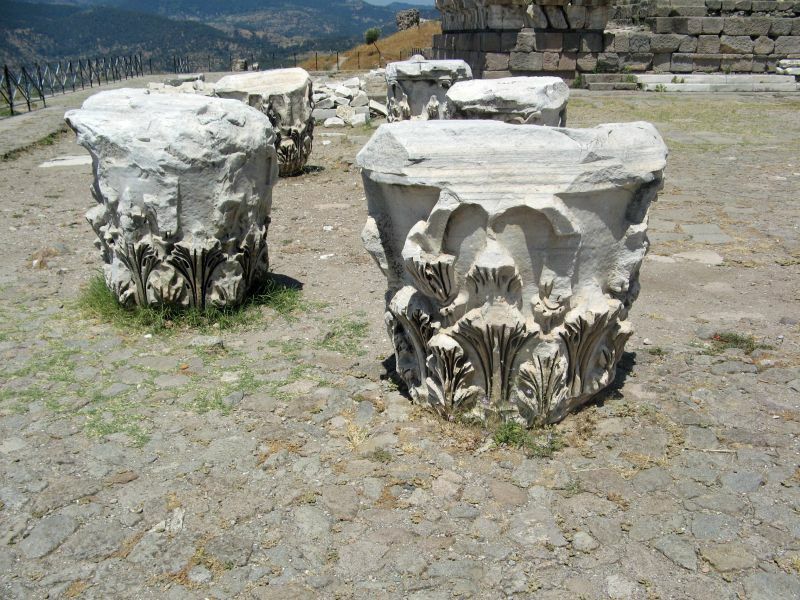 The Attalids became some of the most loyal supporters of Rome in the Hellenistic world. 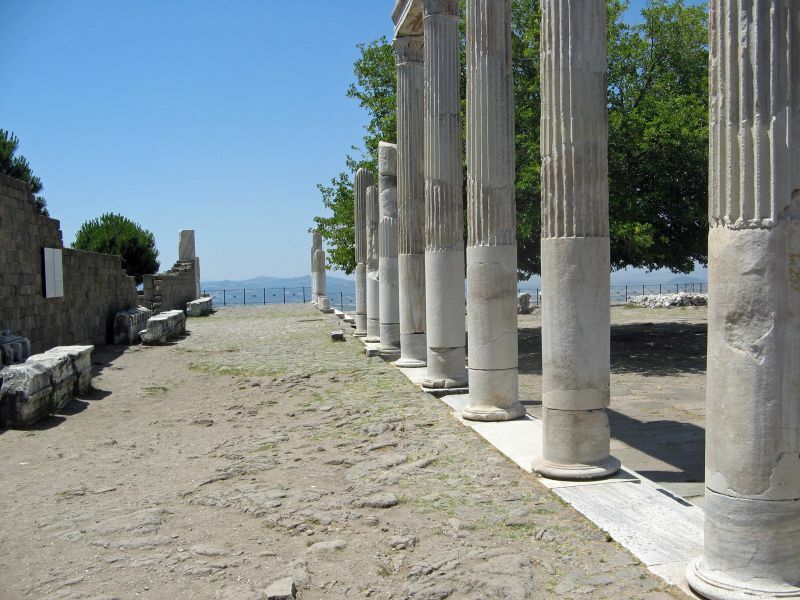 Under Attalus I (241–197 BC), they allied with Rome against Philip V of Macedon, during the first and second Macedonian Wars, and again under Eumenes II (197–158 BC), against Perseus of Macedon, during the Third Macedonian War. For their support against the Seleucids, the Attalids were rewarded with all the former Seleucid domains in Asia Minor. As a consequence of its rise to power, the city expanded greatly. 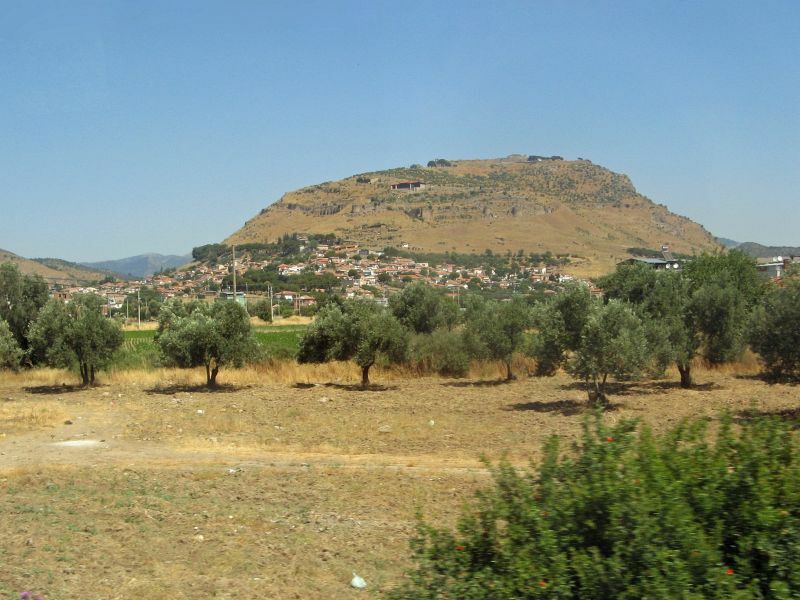 Until 188 BC, it had not grown significantly since its founding by Philetaerus, and covered circa 21 hectares (52 acres). 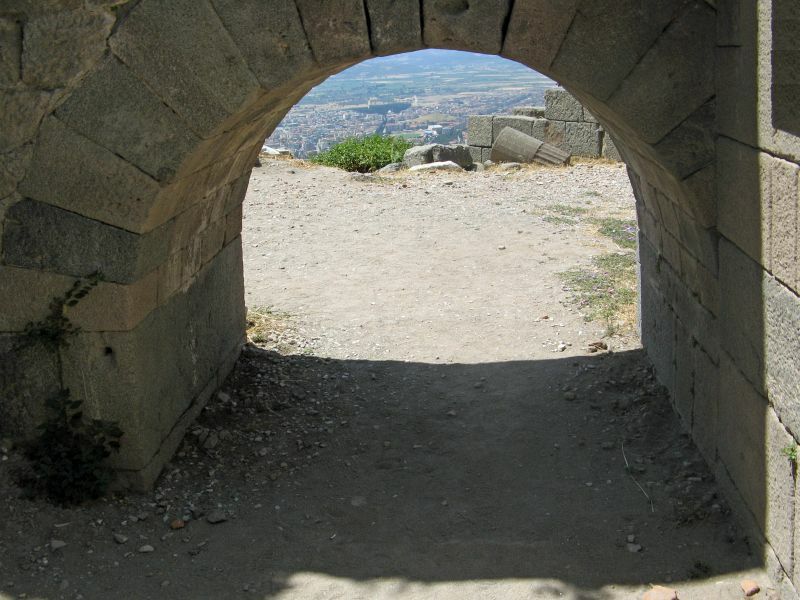 After this year, a massive new city wall was constructed, 4 kilometres (2.5 mi) long and enclosing an area of approximately 90 hectares (220 acres). The Attalids ruled with intelligence and generosity. 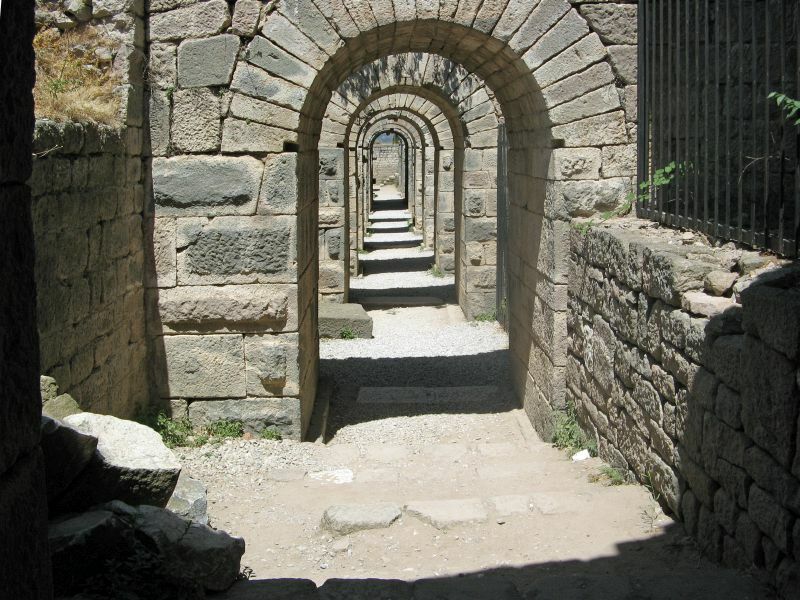 Many documents survive showing how the Attalids supported the growth of towns by sending in skilled artisans and by remitting taxes. 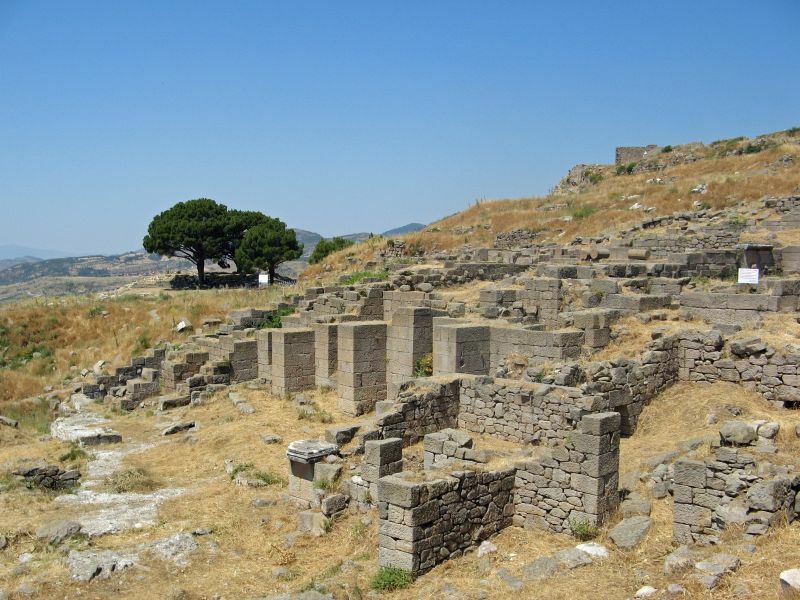 They allowed the Greek cities in their domains to maintain nominal independence. 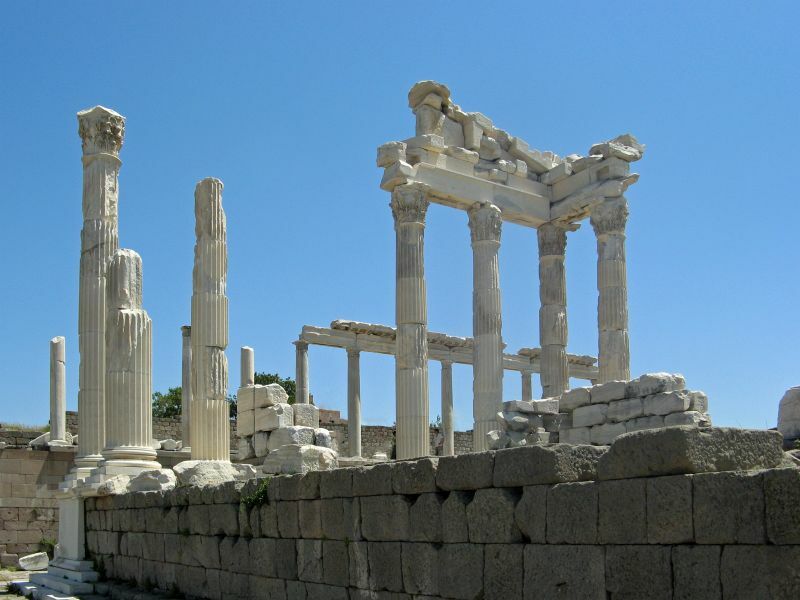 They sent gifts to Greek cultural sites like Delphi, Delos, and Athens. They defeated the invading Celts. 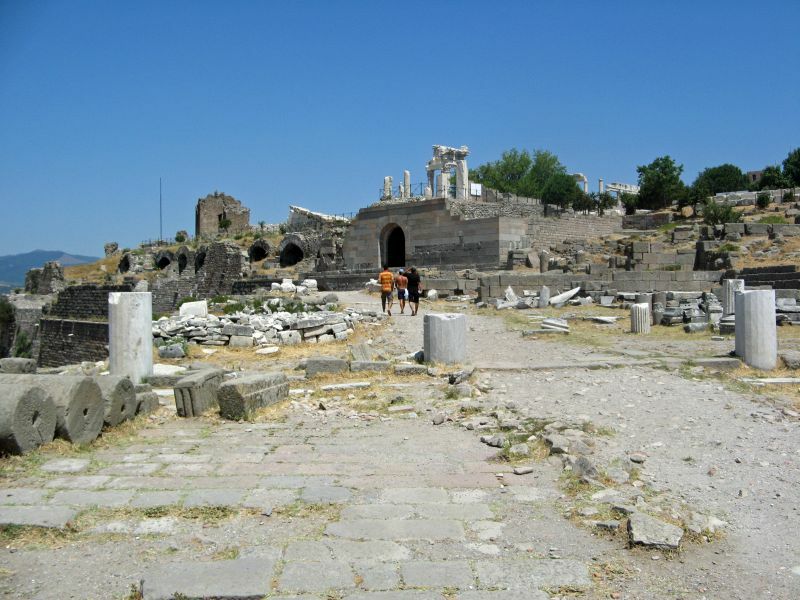 They remodeled the Acropolis of Pergamon after the Acropolis in Athens. 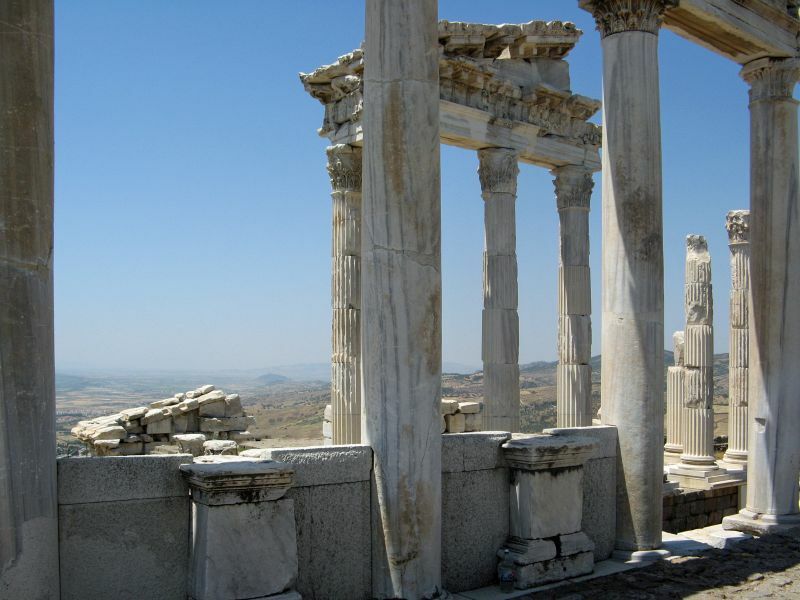 When Attalus III (138–133 BC) died without an heir in 133 BC, he bequeathed the whole of Pergamon to Rome in order to prevent a civil war. 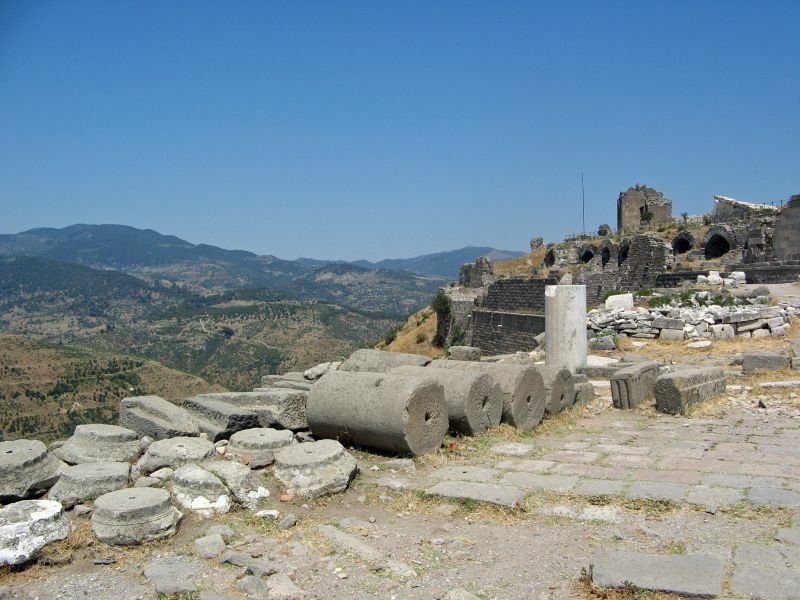 Not everyone in Pergamon accepted Rome’s rule. 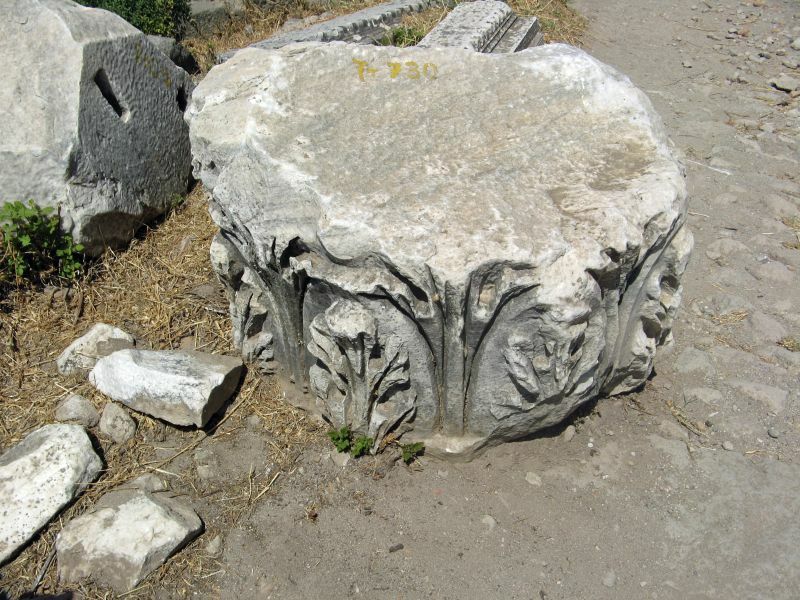 Aristonicus, who claimed to be Attalus’ brother as well as the son of Eumenes II, an earlier king, led a revolt among the lower classes with the help of Blossius. 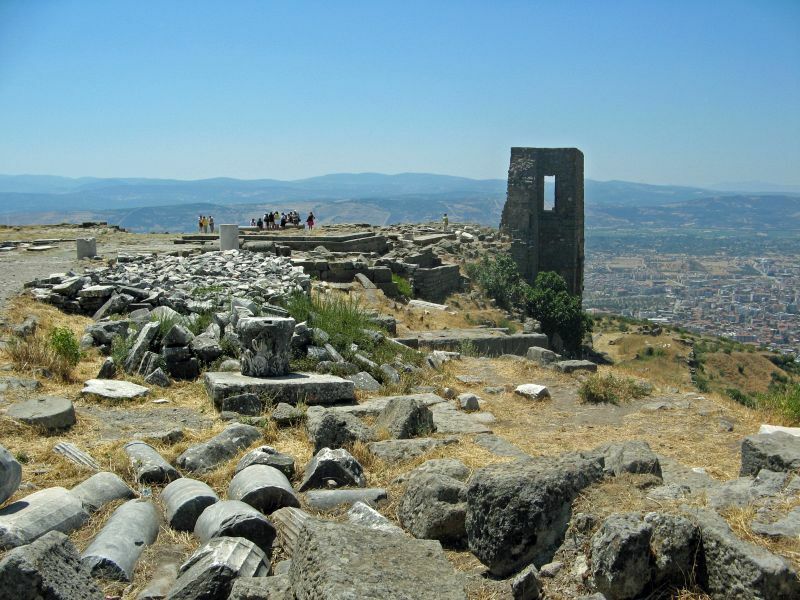 The revolt was put down in 129 BC, and Pergamon was divided among Rome, Pontus, and Cappadocia. 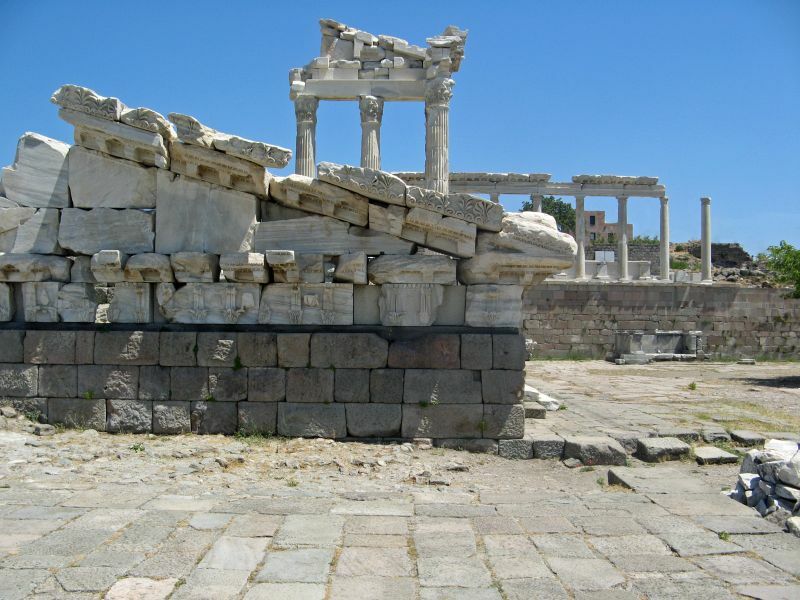 Pergamon was briefly the capital of the Roman province of Asia, before the capital was transferred to Ephesus.After a slow decline, the city was favoured by several imperial initiatives under Hadrian (117 – 138). 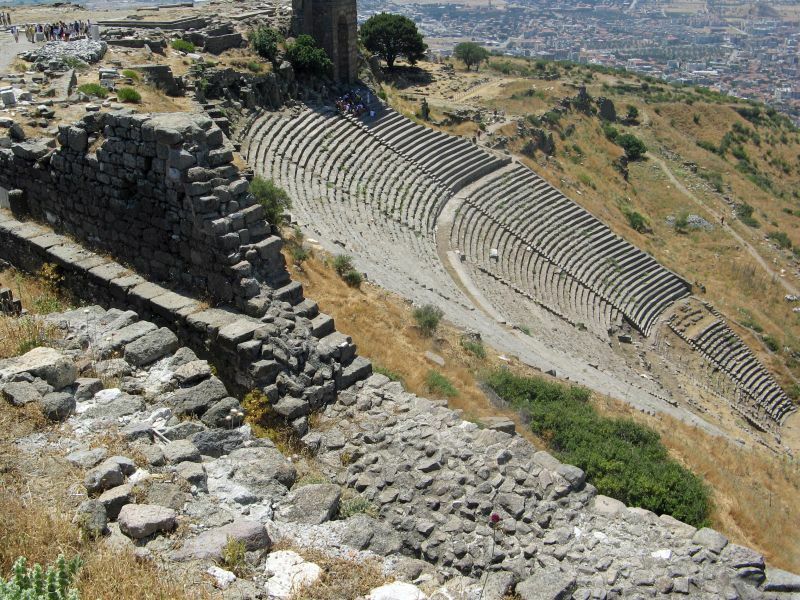 It was granted the title of metropolis and as a result of this an ambitious building programme was carried out: massive temples, a stadium, a theatre, a huge forum and an amphitheatre were constructed. 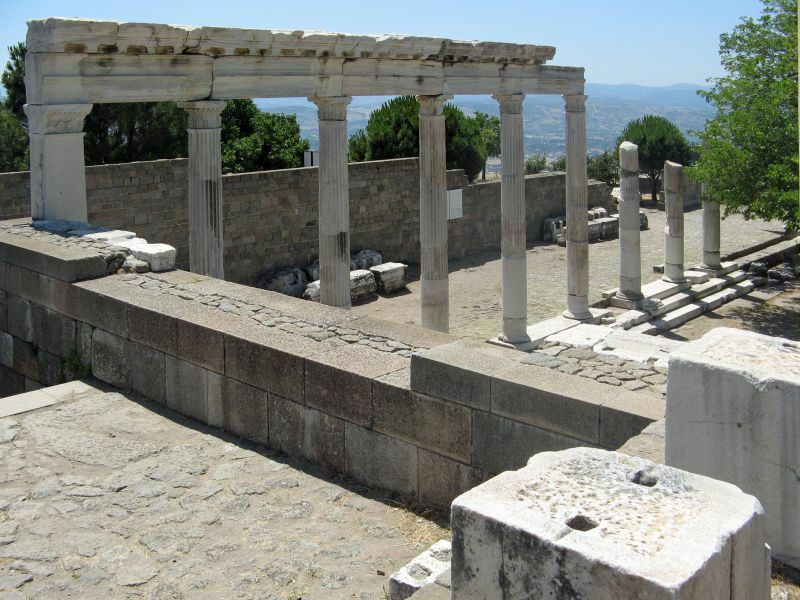 In addition, at the city limits the shrine to Asclepius (the god of healing) was expanded into a lavish spa. 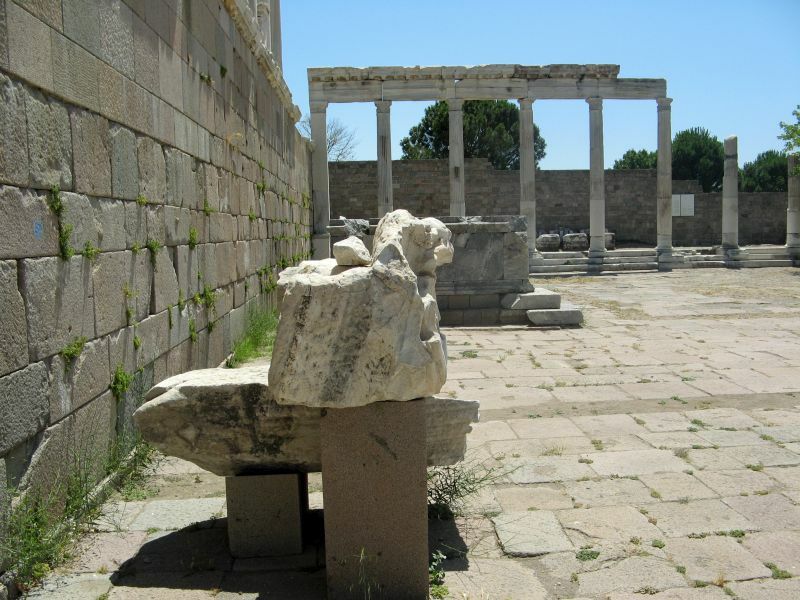 This sanctuary grew in fame and was considered one of the most famous therapeutic and healing centers of the Roman world. 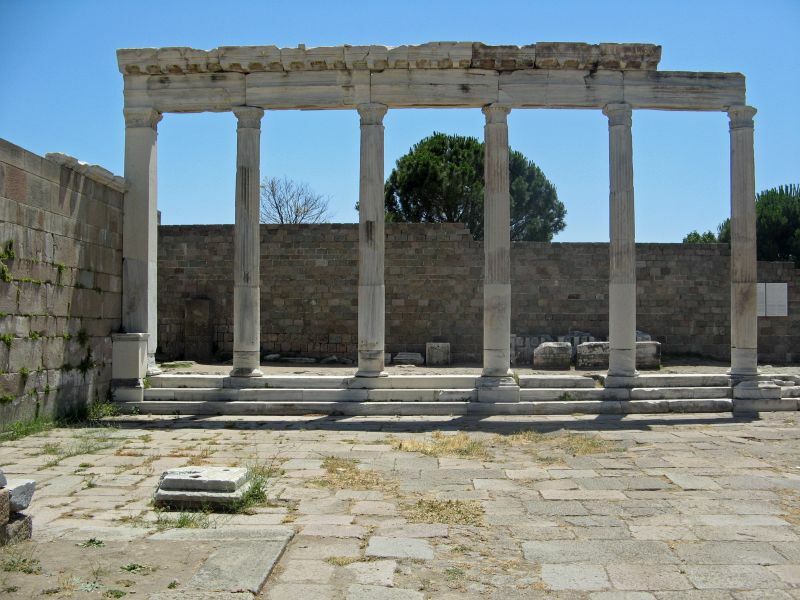 Galen, after Hippocrates the most famous physician of antiquity, was born at Pergamon and received his early training at the Asclepeion. 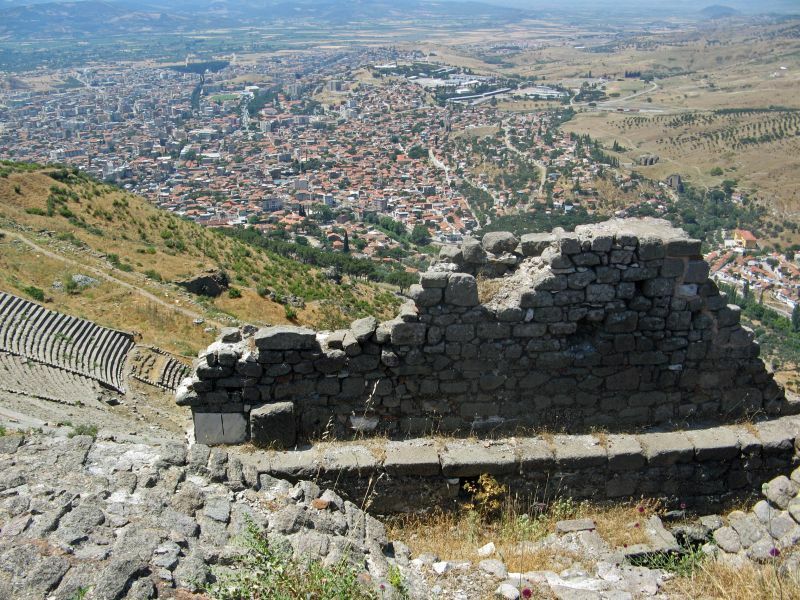 Pergamon reached the height of its greatness under Roman Imperial rule and was home to about 200,000 inhabitants. 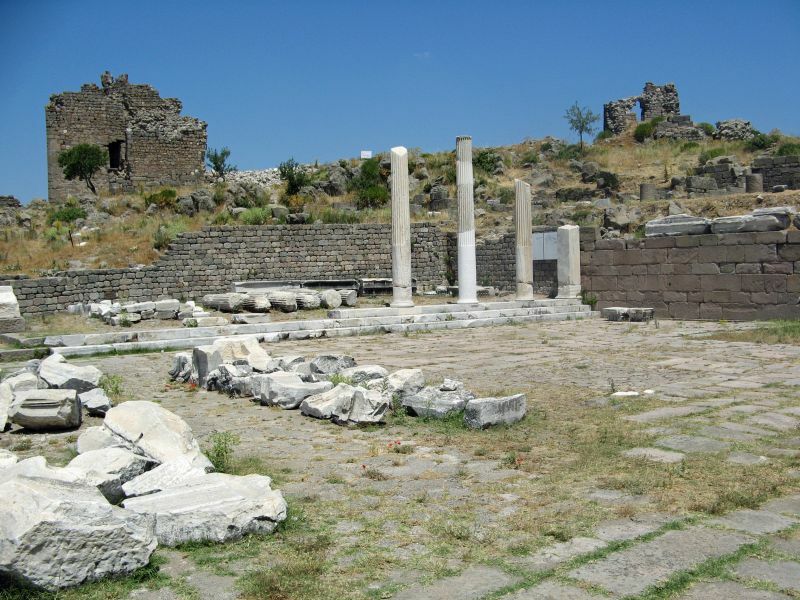 The city was an early seat of Christianity and was granted a bishopric by the second century. 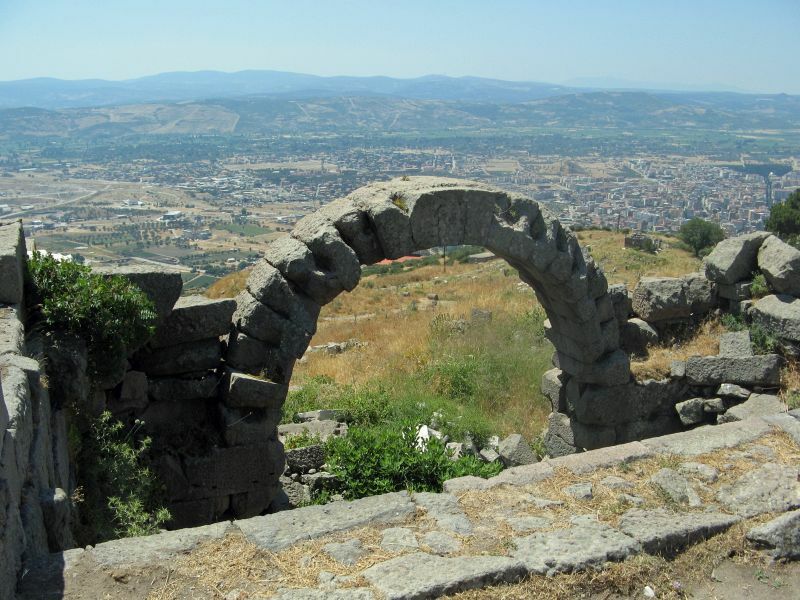 The city suffered badly during the third century and was badly damaged by an earthquake in 262 and was sacked by the Goths shortly after. 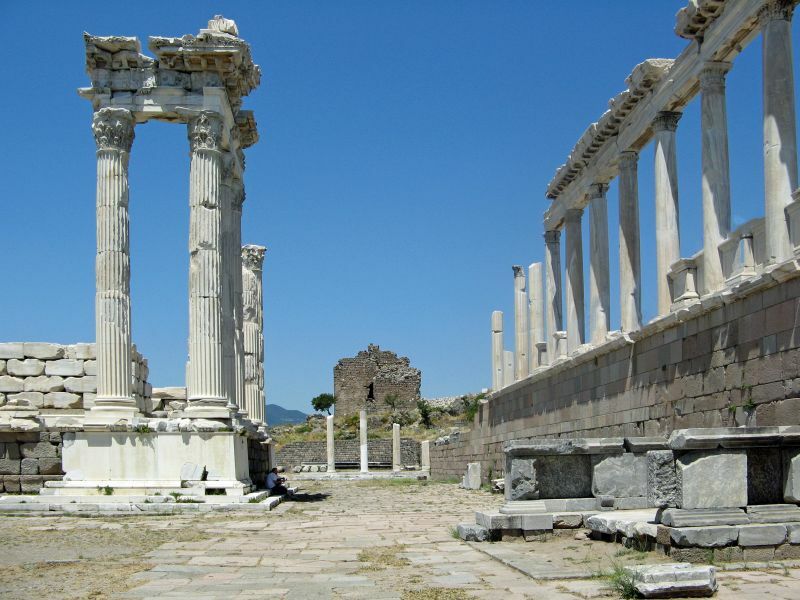 The Library of Pergamon was renowned, and second only to the Library of Alexandria, although not approaching Alexandria in scholarship. Also have a look at the Zeus Altar, removed frm Pergamon in the ninetheenth century, and now on display in the Pergamon Museum in Berlin.